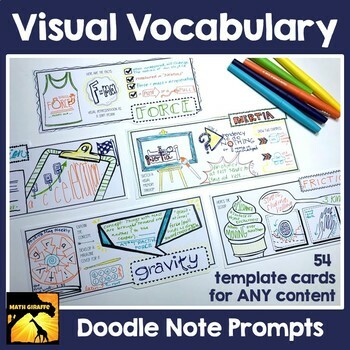 These vocabulary visual prompts act as printable doodle note templates for reviewing key terms! They'll work with any content area and any set of vocabulary words. Each card in the set of 54 templates is a manageable study guide. 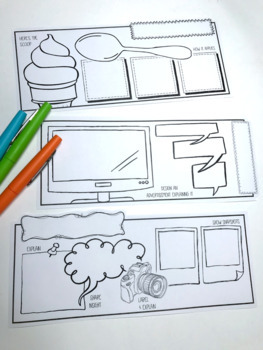 Students can select a graphic layout that fits the particular term or concept and create their own visual review guide. They'll keep & collect them as a reference. 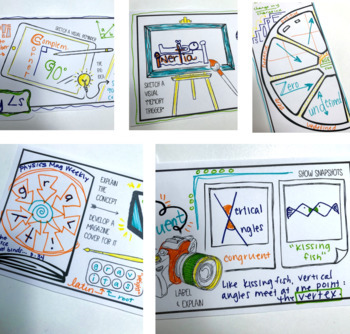 Visual note taking takes advantage of biological brain processing to increase student focus and boost retention! Students use these cards to create visual representations of vocabulary words. These visual "memory triggers" are based upon brain research and activate mental pathways that help them to store the concepts in long-term memory. The graphic layout of these study guides allows students to mentally organize the information in their minds, understand the relationships and connections between ideas, and remember the lesson material better! Students get bonus brain benefits by blending text and graphics to take advantage of dual coding. This set can be used in any subject area, and for a wide range of grade levels. These can form a word wall and/or be used to review key words at the end of each chapter. The pages are not editable. The details are included in the preview file! Check it out to see all the ways to use this card deck and view all 54 cards! 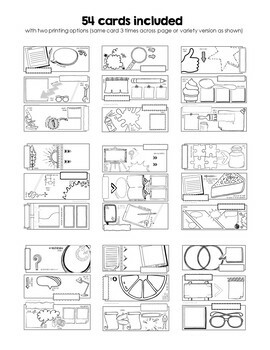 You may also like this similar set of 100 visual graphic organizer cards for concept-based lessons.